UPDATED: Thu., July 26, 2018, 5:16 p.m.
LAS VEGAS – Kyle Lowry had the ball in the right corner. He was well-defended and not able to shoot or drive, so he fired a crosscourt diagonal pass to DeMar DeRozan. For years, that was a fine idea. This time, it became a turnover. They were on different teams during this particular scrimmage, which seems fitting. USA Basketball’s first minicamp of this Olympic cycle started Thursday in Las Vegas, with DeRozan and Lowry – longtime teammates in Toronto – wearing the same uniform again. 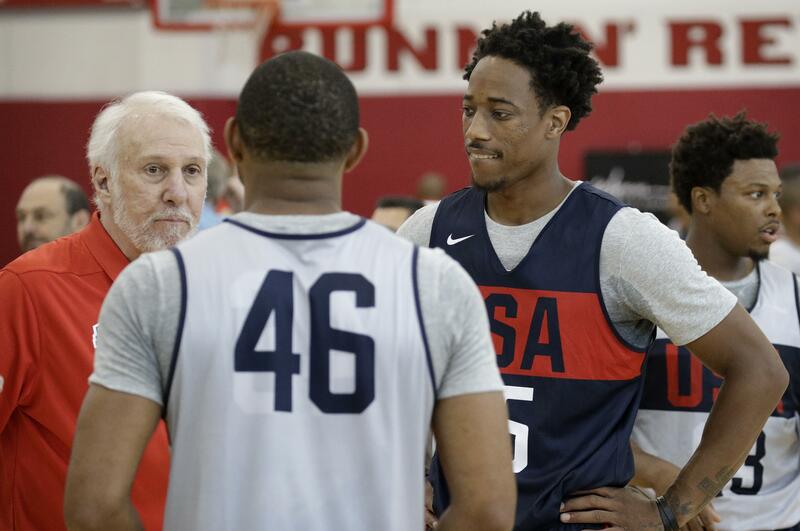 DeRozan is now with the San Antonio Spurs and set to be coached by Gregg Popovich, who just happened to be running his first national team practice Thursday. DeRozan has made no secret: He wasn’t happy getting traded out of Toronto. But if there’s a consolation prize to be had, it’s that he now gets Popovich. DeRozan was sent to the Spurs on July 18, along with center Jakob Poeltl and a protected 2019 first-round pick, for Kawhi Leonard and wing Danny Green. Leonard was one of the 35 players invited to attend this minicamp. He was one of roughly a dozen who didn’t show, a list that also includes LeBron James, Stephen Curry and Klay Thompson. This two-day camp that ends Friday is little more than a get-to-know-you-better event for the players and Popovich. There are no games to play, and technically there aren’t even future tournaments to prepare for – under the new qualifying rules, the U.S. isn’t yet assured of having a spot in either the 2019 FIBA World Cup in China or the 2020 Tokyo Olympics. The task of making sure the Americans get to China next year has fallen to G League players, who are being coached by Jeff Van Gundy and went 5-1 in the first round of qualifying. The second round of qualifying starts in September. Popovich is taking over the national team reins from Mike Krzyzewski, the Duke coach who led the U.S. to Olympic gold in 2008, 2012 and 2016. Krzyzewski was in the gym to watch Thursday. But as far as whether Popovich got a little something extra out of working with DeRozan, that was kept secret. Popovich wanted to keep his answers specific to USA Basketball, not the Spurs. “That was a good try,” Popovich said to one reporter who asked about coaching DeRozan. DeRozan spoke plenty, though. There are many tough parts to him leaving Toronto, and not having Lowry at his side anymore will be one of the hardest for him to deal with. They were inseparable at times together Thursday, even wrapping up their end-of-practice shooting at the same time before retiring to a row of chairs to get icepacks strapped to their legs. Published: July 26, 2018, 5:06 p.m. Updated: July 26, 2018, 5:16 p.m.